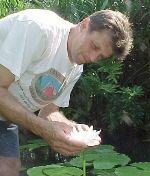 Andre Leu has, for many years, been the "voice of authority" about the Australian subgenus of waterlilies which includes N. gigantea on email discussion lists. Waterlilies in the subgenus Anecphya, affectionately known as the Aussies, can be difficult to get started and to keep going for many, so interest has been somewhat limited however passionate. Andre has done a great deal to not only build the base of knowledge about the Aussie waterlilies but to introduce a wide variety of seeds of the various species into cultivation. His contributions are producing offspring which are easier to grow than those in cultivation until now. Andre, his wife Julia and their two sons Asha and Nick live in Daintree, tropical north Queensland, Australia. This must be one of the most beautiful places in the world to live - it is where the tropical rainforest meets the Great Barrier Reef. His business is the organic farming of rare tropical fruits. As a child Andre made ponds and filled them with fish and aquatic plants. He had to stop his brother from feeding goldfish to turtles. Growing up in the warm temperate area of Sydney he always wanted to live where mangos grew. When he finished school he moved to the tropical Cairns area. He began learning about the organic growing of tropical fruits when he worked as a farm hand on one of Australia's first organic tropical fruit farms on 1972. As well as practical hands on teaching, such as making composting, mulching, planting of ground covers and techniques in pest and weed control, his employer ensured that he had access to his extensive library on organic growing. It was on the first collecting trip that Andre and Julia met in northern Thailand and they traveled together across Asia and Europe to London. That astonishing trek will be the subject of an article to come. They were married 11 months after meeting and have always traveled to strange and wonderful places in the world, even with their two sons. They travel regularly to Asia to collect fruit and other ethnobotanical accessions and to study their cultivation in their countries of origin. Andre reads Indonesian and Malay in order to keep up with the latest horticultural research in these countries. Smatterings of other languages, knowledge of local cultures and talent with a guitar have made them welcome guests wherever they travel. Andre received a Bachelor of Arts Communications from University of Technology Sydney in 1989 with double majors in Video Production and Social Political Theory. He received a Graduate Diploma in Adult Education from the University of Technology Sydney in 1992 and is a Qualified Teacher of Horticulture and Environmental Studies, Douglas Campus, Tropical North Queensland Institute of TAFE. Julia delayed a post-graduate degree in Education for only a year after she met Andre and, after teaching for a number of years, is currently the Manager of Community Services at the Douglas Shire Council. They bought their current farm in Daintree in 1991, where Andre has continued to be a pioneer and active participant in the development of the commercial organic cultivation, harvesting, packaging and marketing of exotic tropical fruits. This also has led to improved culture of some of the more difficult aquatic plants. 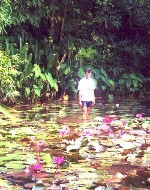 The account of Andre's most recent expeditions to collect Anecphya plants and seeds can be found in his "Field Collecting Australian Water Lilies" and his photos in "Andre's Gallery".